Sawdust and Dirt: Breakfast Cups? Weather good today, breezy, warm. Still at it. 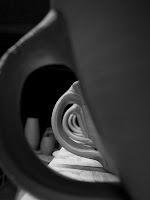 Tomorrow should be my last wet day, well, maybe Monday....Haven't made any jugs. There's always the tonight.